Union and union_all Function in R : Union of two data frames in R can be easily achieved by using union Function and union all function in Dplyr package . Dplyr package in R is provided with union(), union_all() function. UNION_ALL function in R combines all rows from both the tables without removing the duplicate records from the combined dataset. Union Function in R :UNION function in R combines all rows from both the tables and removes duplicate records from the combined dataset. 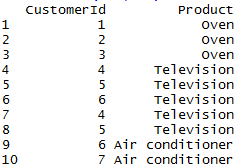 So the resultant dataframe will not have any duplicates. union_all Function in R example:UNION_ALL function in R combines all rows from both the tables without removing the duplicate records from the combined dataset. So the resultant dataframe will have duplicates.